Therese Argoud graduated with her Masters in Public Health (MPH) in 1985. For her, supporting the health of Hawai‘i’s communities started by working on a statewide regional perinatal health system and later coordinating the Hawaii Keiki Information Service System (H-KISS) to link children with special needs to services. Although these were rewarding experiences, it wasn’t until she joined the Injury Prevention & Control Section of the Hawai‘i State Department of Health that she fully appreciated and applied her public health skills and background. “I’ve worked here for over 21 years, starting as the childhood injury prevention coordinator, where the focus was on working closely with other state agencies and county and community partners to implement policy initiatives, including legislation and a system of services for child passenger safety,” Therese remembers. “We are here to help partnering organizations and communities to integrate effective injury prevention strategies in their own work, ideally grounded in data from multiple sources,” she adds. Therese’s first mentor was her father, who brought his family to Guatemala to provide medical support to struggling villages. Later, an interest in nutrition and international health called Therese to pursue an MPH at the University of Hawai‘i. Therese is grateful for the opportunity to study epidemiology with the late Dr. Robert Worth at UH Public Health. This experience taught her how data can be translated into stories that help us identify public health challenges and their solutions. “What I love about my work is developing long-term relationships with organizations whose contributions combine to increase safety in our communities,” says Therese. One example is the 1999 Honowai Playground Project, involving an 18-member private public partnership that raised awareness about childhood injury hazards that occur on playgrounds. Stakeholders redesigned, funded, and built a wonderful community playground. “The project, together with playground safety certification training for Department of Education Safety Facilities staff, inspired legislation that created Hawai‘i’s first comprehensive standards for safe playgrounds for public elementary schools statewide,” says Therese. 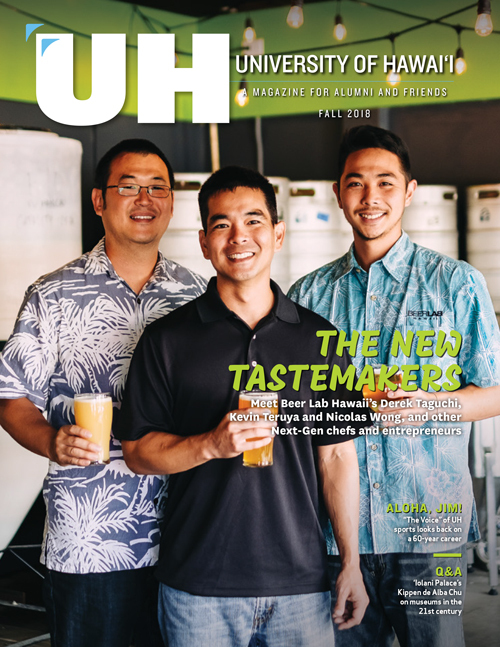 The 1999 Honowai efforts have made a lasting impact on the Department of Education's approach to continuing to build and refurbish playgrounds designed to optimize children's health and learning. To learn more, click here. “Public health works when we can engage stakeholders to not only define challenges based on data but also to own solutions that they help to create and implement. Participation at all levels is central to public health philosophy, and it is an important part of our work in injury prevention,” she adds. 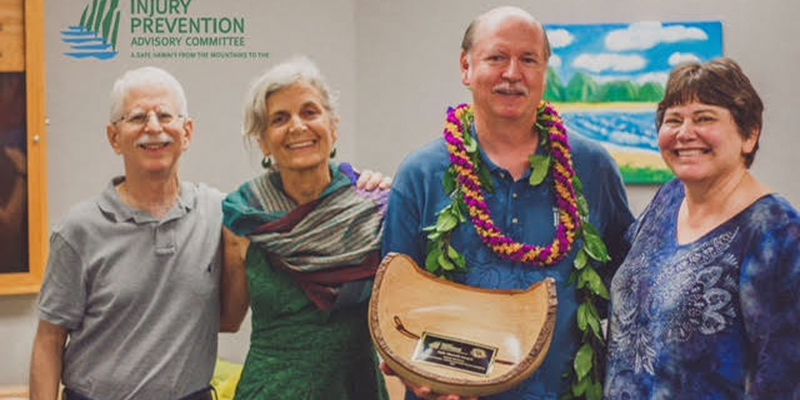 Top photo caption: Bruce McEwan, former chair of the Injury Prevention Advisory Committee, receiving the “Safe Hawai‘i” award. On his left are Eric Tash (MPH, 1974), former DOH Injury Prevention & Control Section (IPCS) manager and Therese Argoud (MPH, 1985), current IPCS Program Manager. On his right is Dr. Deborah Goebert (MS, 1987, DrPH, 2000), current IPAC Chair. 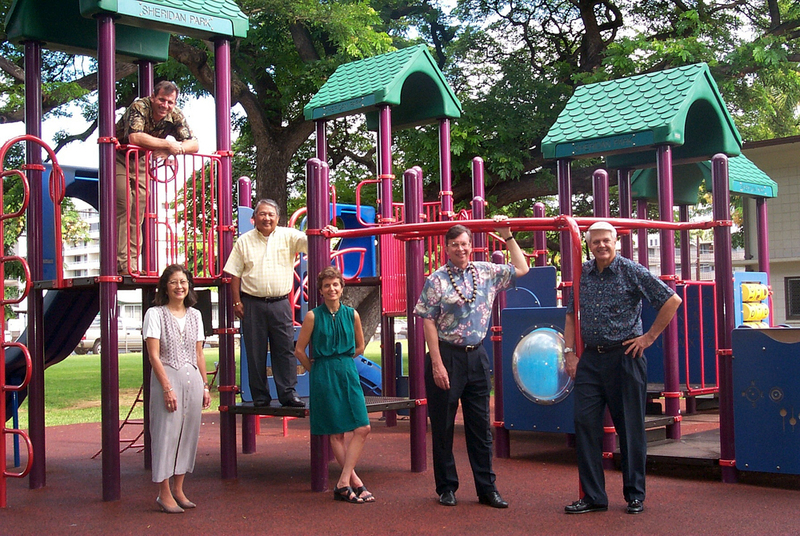 Photo caption: Members of the 1999 Honowai Playground Project team: Mike McFarlane, Coast Recreation, Inc; Susan LaFountaine, Keiki Injury Prevention Coalition/SAFE KIDS Hawaii; Hawai‘i State Senator Calvin Kawamoto; Therese Argoud, Hawai‘i State Department of Health, Injury Prevention & Control Section; Jeremy Harris, Honolulu City & County Mayor; Robert Hiam, HMSA President and Chief Executive Officer.